I was born in a small country in South America characterized by its diversity of scenery, flora and fauna, and most certainly, its people. It’s true that it’s a small country, but it has a vast wealth of biodiversity and people of different races who all have enormous and generous hearts. I was born right in the Middle of the World –in Quito, the capital of Ecuador. And this small country just 109,484 square miles in size is divided in 4 regions. Let’s take a quick look! The coast is where you can enjoy beautiful beaches along the entire Pacific Ocean shore. And you can explore a number of ecosystems here also –tropical and dry forests, mangroves and rocky cliffs. The sierra is characterized by mountains and snow peaks that form the renowned Andes Mountain Range with more than 20 volcanoes, about 5 of which are still active. 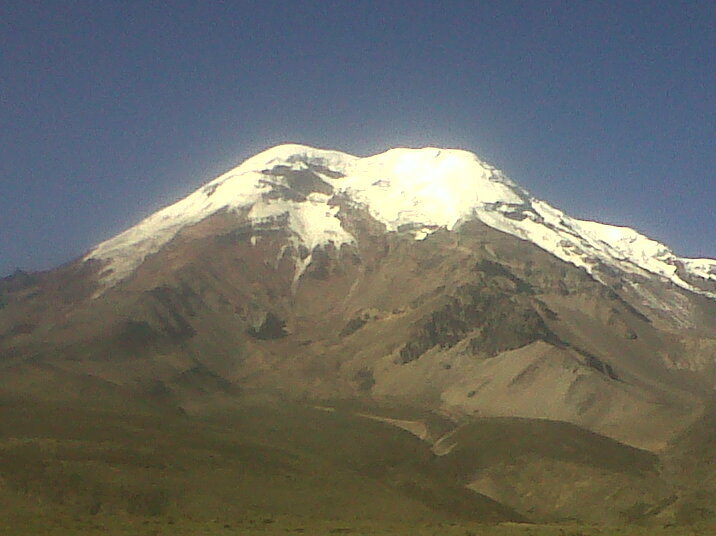 It is here where the imposing Chimborazo rises to 20,564 ft. Continuing on with this expedition, we have to cross the Amazon forest, a region rich in thousands of birds, mammals, insects and other creatures that harmoniously co-inhabit in this amazonic paradise. And finally, there are the famous Galapagos Islands, an extraordinary venue where warm and cold currents attract and unite unique species. UNESCO has declared this exotic archipelago as Natural Heritage for Humanity. So I’ve lived a great part of my life in my country, Ecuador, where I’ve shared a few fleeting impressions. However, I’ve also had the unique opportunity to travel and see other countries, other cultures, other races, and most certainly, other panoramas. I’ve visited about 25 countries in 4 of the 5 continents, and what’s been most extraordinary in these incomparable travel experiences has been discovering places just as beautiful and wonderful as those of my own country. I’ve met people from very different cultures, but they’ve proven to be very much like my people. They’re people who to some extent face the same kinds of problems, and they share the same emotions of happiness, sadness, anguish, dream and hope. Some of their childhood dreams have come true and unfortunately, others have not. All of us, absolutely all of us on this planet Earth are undoubtedly surrounded by excellence. It makes no difference whether we’re wealthy or poor. Some of us will delight in the majesty of the mountains and someday some of the bravest of us may even climb them. Some of us will delight in swimming or even sailing in the midst of playful waves; while still others will almost certainly experience the adventures of the legendary Tarzan as they live and grow up in thick, exotic jungles. And all of us, absolutely all of us will someday look up at the sky and see its beauty. The sunlight will shine so brightly on our faces that our eyes won’t be able to resist it. And at night, the moon and stars will convince us there’s Someone who’s guiding us even in the dark. Mountains, rivers, valleys, hills, oceans, mangroves and exotic jungles… Sun, moon, stars, constellations and infinite space… All of it created to perfection! Who could have made this so perfectly, so precisely, so meticulously? This is the world that surrounds me –the world that surrounds all of us. It’s a world originally created in perfection and beauty, assembled with the utmost skill and precision. And it’s not limited just to this world, our planet or even our galaxy. We’re so infinitely small when we compare ourselves with the great universe and the hundreds of millions of existing galaxies. Who are we? Who made this planet that’s our home, and who made this planet’s home, the universe? I personally feel there is no other answer but this. Yes, this is the God, the Creator of the Universe, who has given us the privilege of living and administering a very small part of His extraordinary and vast creation –the Earth. Consequently, this is my commitment –to be an instrument of God, to be His ambassador and further His Kingdom and to live a life that pursues excellence in every place, at every moment and in every thing, and most definitely, promote this kind of life in every country where it’s possible for me to do so. I know I was created by the God of excellence and now I’m called to live and lead a life that strives towards excellence. So have you stopped to think that in spite of how difficult your circumstances may be, you are still surrounded by excellence? Do you know that you were created by God, the Creator of the Universe and that you were created for “good works”? Wouldn’t you like to join this journey towards excellence? ← Open your window and see the beauty and greatness of God’s creation! I just love this. Bless you Cecy. This is my heart and passion. Thank you so much for your kind comment. I´m so happy to know that you agree. Let´s continue to influence others to walk the path towards excellence! So, please share this blog with your friends anytime. Well written and inspiring! keep up the gr8 job Ceci mam! Dear Kavitha, thank you for following TE. Feel free to share this link with your contacts.